Now, I used this camera to have fun with it - i did not do any lens chart test pics, pixel-peeping etc. Neither do I have the technical means to make such a test nor do I want to make it. If you look for this, just google around, you will find hundreds. How can a mobile phone have a camera with 41MP? The idea behind this number is simple: its difficult to build a zoom lens in a thin mobile phone. Zooming digitally is quality-wise really crappy - so: take a high-resolution picture (with 41 MP or 34MP as Nokia shows in some screens) and zoom after taking the picture. There are enough pixels left and the quality of the lens allows for this. At any time you can go back to your 34MP photo and recompose/crop a new version of the 5MP. Combined with sharp Zeiss optics, an image stabilisation mechanism (you can even hear the lenses shuffle when you move the phone) makes a quite capable camera on paper. Now if you e.g. upload your photos to skydrive, the 5MP version gets uploaded automatically (3072x1728 pixel). To get the full size images you need to connect your phone via USB and copy them directly. Since I work as a photographer I was blown away to hear, that Nokia is providing us with RAW DNGs out of the mobile phone camera soon: see here. Unfortunately so far I was not able to test this. The Lumia 1020 camera allows you to control ISO and shutter speed manually. You still cannot change the aperture, but at least you can decide between ISO and shutter speed in your pictures. The Lumia 1020 comes with a huge pack of apps that help getting the most out of your camera. I recommend using Nokia Camera for taking your Pictures. I played around with the Nokia Smart Cam but was not able to get real stunning results so far - but they implemented nice ideas and I was just using it in the wrong context. Unfortunately I have not found time yet to test the Nokia Cinemagraph, Nokia Creative Studio and the Nokia Panorama. Posted on November 20, 2013 by Michael Seirer and filed under Photography, productivity, Testing, Windows Phone, Windows Store Apps and tagged Nokia Lumia 1020. I already blogged about replacing my most important Apps i use on the iPhone with Windows Store Apps. In general, this was OKish, but most of the time it was with a stale and vapid feeling. With one exception: the set of HERE apps from Nokia. Usable, does what I expect from it and it can be used offline. N'uff said. A pretty cool feature called "My Commute" knows your regular routes you drive and shows you the estimated travel time - taking traffic information into account. If you pin these route(s) on your start screen you always know how long you are driving. You can see that i use 43 minutes to commute to the code4ward head-quarters (normally its more like 25-30 mins) - and an exclamation mark. You can drill down and check, where you have the traffic jam. Drive+ also enables you to search for an alternative route. But what I like most is the tile on the start screen - a perfect example of how information can be presented in a short and concise manner! It's basically the same for public transportation. There are similar offerings here in Vienna like the homepage of the Wiener Linien or the app "Qando". 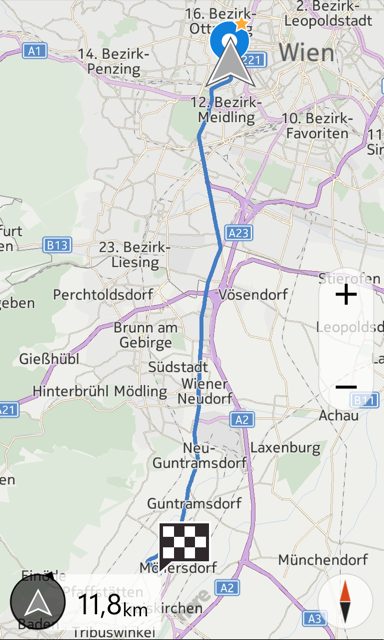 But both have a bit complicated UIs - HERE transit is easy to use and it shows details of the bus/tram i use, how the stations are named, how many etc. Posted on November 12, 2013 by Michael Seirer and filed under productivity, Testing, Windows Phone, Windows Store Apps and tagged Lumia 1020. My first impression is: its huge. I deliberately wanted to test the 1020 because of its camera. But compared with my IPhone 4s (and even with the 5) its a big device. Fortunately it has a similar weight than the IPhones - so it actually feels light in my hands. Compared to the IPhone 4s (sorry, I don't have a 5 or 5s yet) the Lumia 1020 is much clearer, punchier and contrasty. The colours pop a lot more - black is actually black. Now, you can like this or not - I for my part find it more pleasing. Though what i really don't like is that the colours shift heavily if i change the viewing angle. When I use the phone as a normal user - I look directly at the screen - everything is fine. But when i start looking form the sides its like the white-balance os off and i see a heavy greenish color cast (especially visible on white). Since I am a photographer I might be more sensible to this, but then again: my iPhone is not having this "feature". I know and like that you can modify the color temperature - see the blogpost of the official Nokia blog. I did not do any scientific tests but it feels like its en par with my IPhone 4s battery lifetime. I had numerous problems with the HERE maps, HERE transport etc because of an error of the compass. Moving the phone in the suggested shape of an 8 did not help. Now, i've seen this on the IPhone as well, but not that often. 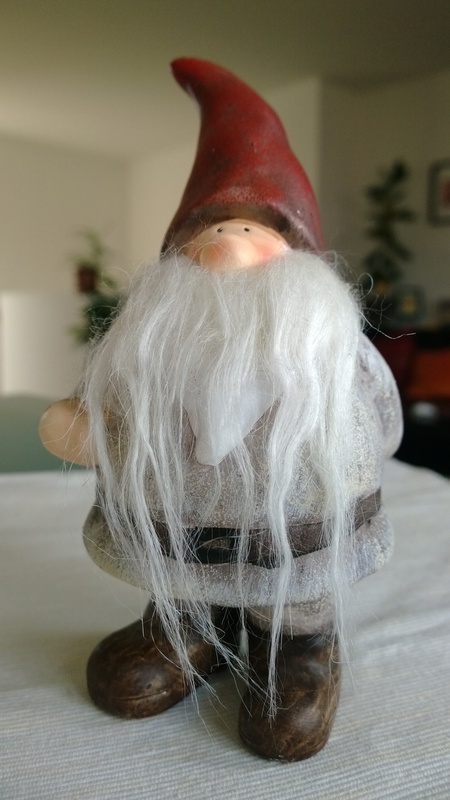 Posted on November 10, 2013 by Michael Seirer and filed under productivity, Testing, Windows Phone and tagged Lumia 1020. Be aware, that this is not an in-depth test of any of the apps. I just use them on the go and try to get along with them - i didnt test all the features of all apps. For those who don't want to read the details: in general I am satisfied with the Apps you can find the Windows Store - some (like Spotify and Foursquare) i like even more on the Windows Phone! Previous iOS7 i would have said that the two platforms are on the same level when it comes to develop usable apps. But with iOS7 Apple has done a good job (and actually applying and further enhancing main concepts that have been introduced by Microsoft in their Windows Phone 7 platform already!) and so they are ahead in the game already. I was astonished, how fast iOS apps are adapting to the new iOS7 style and now after a couple of weeks, almost all important apps have the iOS7 look. Also I believe that the "level of innovation" is still lacking in the Windows Phone area - the really cool and innovative apps are most of the time available for iOS and Android first. For example: Cycloramic re-invents how to do panorama pics , or measuring your heart rate with the IPhone. I think the new way of the iOS7 to display/hide the url and the navigation bar is quite sleek. But the browser on the WP8 is good enough. Sometimes websites don't seem to recognise the device as a mobile device and respond with the full website. The calender is ... well, there is room for improvement ;) I miss a search, the monthly overview is useless (you can't read the text anyway, just display something that shows that you have a meeting). Also with iOS7 there calendar was pimped with some really nice features like traveling time display. On iOS I use Tweetbot - not for free but really useful. It can handle multiple twitter-accounts and remembers what tweet you have read already. Even if you switch device! It's beautiful and you can navigate easily with one hand. The WP8 twitter app is not having any of these requirements. But i might have to dig deeper to find a good one. I did not buy the WP8 version, but the screenshots look similar. The Foursquare app for WP8 is actually nicer than the iPhone version. 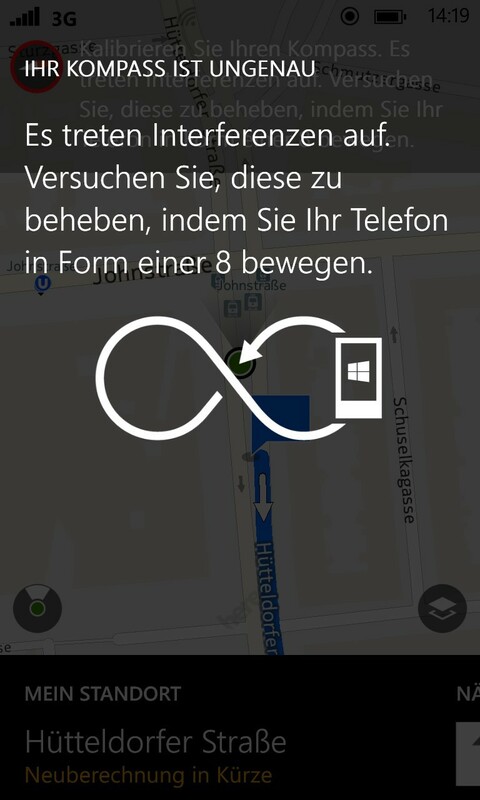 Nothing to say here, the WP8 app do their job. The camera of the Lumia 1020 deserves its own blogpost though. The Spotify app is really well designed - i like it more than the iOS version. I listen to many podcasts - i use the pre-fetch functionality and expect that when i am on the road, the podcasts (also video-podcasts with 100mb+) are already downloaded when i am at home and have WLAN access. On the Windows Phone it seems, that there is no central place for podcasts. If somebody did an application (!) to encapsulate a podcast, you can install it. But this might even come at some cost! (To make this clear: you pay a guy that did a small wrapper-app around the Podcast, NOT the owner of the podcast that generates the actual content) I am very disappointed about the podcasts. I tested the app IPodCast which did a much better job. Though it could not find all the podcasts i am listening to. I've tried some Apps for WP8 but the filter did not convinced me so far. I will give the Nokia Smart Cam a more detailed look in another post. I am not using this one heavily, for taking notes i actually use Day One. Though the Evernote app on WP8 is well designed and shows how efficient the design language of Modern UI apps can be! The default mail app is sufficient, the display of threads is nice, setup of my exchange account went smooth. Also the messages app is doing its job so far. Posted on November 7, 2013 by Michael Seirer and filed under productivity, Testing, Windows Phone, Windows Store Apps and tagged Lumia 1020. So, I got this Lumia 1020 for testing. It's super-easy to move your contacts (and also photos if you wish) from your "old" phone to the new. For phone functionality i just put in my micro sim card and we are good to go. Except... I wasn't getting any SMS anymore. After some digging, i found out that a nice feature of iOS is how a problem: if an apple device is sending an SMS to another apple device, they chose to use "iMessage" as protocol, not a regular cellular-data bound SMS. Supposedly there is a fallback if Apple can't deliver the message, but in my case I still have an IPad and OSX running, so they technically CAN deliver the message. So, you have to configure your mobile-number to not accept iMessages anymore. If you do this on all your devices, you finally can receive SMS again. Posted on November 6, 2013 by Michael Seirer and filed under Photography, Testing, Windows Phone and tagged Lumia 1020.